On Jan. 31, not every place on Earth will see the Blue Moon this month, because the second full moon of January won't technically appear in those places until Feb. 1. These places include regions in eastern Asia and eastern Australia, where skywatchers won't see the first full moon until Jan. 2 and the next full moon until the morning of Feb. 1. For example, in Melbourne, Australia, the full moon arrives on Jan. 2 at 1:24 p.m. local time, and the next full moon is on Feb. 1 at 1:26 a.m., so skywatchers will technically miss the Blue Moon by less than 2 hours. Blue Moons are not as rare as the old saying "once in a blue moon" implies; they happen about once every 2.7 years, because the number of days in a lunation (new moon to new moon) is a bit less than the usual calendar month — 29.53 days as opposed to 31 or 30 days (except for February, which has 28 days, so a blue moon cannot occur). A sequence of 12 lunations adds up to 354.36 days, against the 365.24 days in a year. The discrepancy adds up over time, until a year will have 13 lunations as opposed to 12. For some observers, 2018 will feature two Blue Moons — one in January and one in March (with no full moon in February). Though a supermoon does appear slightly larger in the sky than a full moon that takes place when Earth's lunar companion is farther away from us in its orbit, the difference is nearly impossible for most skywatchers to notice because the moon is so bright and the maximum possible difference in the moon's apparent size is small (only about 14 percent), according to NASA. Unlike solar eclipses, which are only visible from specific places on Earth, lunar eclipses are visible from anywhere it is nighttime. Lunar eclipses don't occur every month because the plane of the lunar orbit is slightly tilted relative to the plane of the Earth's orbit, so the Earth, sun and moon don't always line up to put the moon in Earth's shadow. For the Jan. 31 lunar eclipse, viewers in some places will not be able to see the entire event because it starts near moonrise or moonset. Lunar eclipses are only visible on Earth's night side. Observers in New York City will see the moon enter Earth's penumbra (the lighter, outer part of its shadow) at 5:51 a.m. on Jan. 31. The penumbra darkens the moon only a little; unless you're especially keen eyed, it is often difficult to notice. The moon will touch the umbra, the darker part of the shadow that gives the eclipse the distinctive look of darkening and reddening the moon, at 6:48 a.m. local time. But the moon sets only 16 minutes later, so New Yorkers will get to see only the first part of the eclipse. To see as much of the eclipse as possible, you'll want to be near a flat western horizon. In Denver and points west, the eclipse will start at 3:51 a.m. local time, with the umbra reaching the moon's edge at 4:48 a.m. The point of maximum eclipse, when the moon is deepest in the shadow of the Earth, will occur at 6:29 a.m. For the Mile-High City, the moon will set after the lunar eclipse ends at 7:07 a.m. local time, when the moon exits the umbra. Moonset will follow at 7:10 a.m.
As one travels west across the Pacific, the lunar eclipse will occur earlier in the night; skywatchers in Hawaii will be able to see the entire thing from beginning to end, as will Alaskans and viewers in eastern Asia and Australia. On Jan. 31, people in Tokyo will see the lunar eclipse's penumbral phase start at 7:51 p.m. local time. The umbra will touch the moon at 8:48 p.m., and the maximum eclipse will be at 10:29 p.m. At 11:07 p.m., the moon will reach the opposite side of the umbra, and at 12:11 a.m. on Feb. 1, it will emerge and enter the penumbra. At 1:08 a.m., the eclipse will end for viewers in Tokyo. Viewers in Moscow will see the moon make a dramatic entrance as it rises while it is still red and deep in Earth's shadow. Moonrise there is at 5:01 p.m. local time on Jan. 31, and the moon will reach the edge of the umbra at 5:07 p.m. The moon will emerge from the dark part of Earth's shadow at 6:07 p.m. In New Delhi, the moon will rise at 5:55 p.m. local time and will be fully covered by the umbra at 6:21 p.m., so it will turn red just as it reaches about a half a hand's width above the eastern horizon. 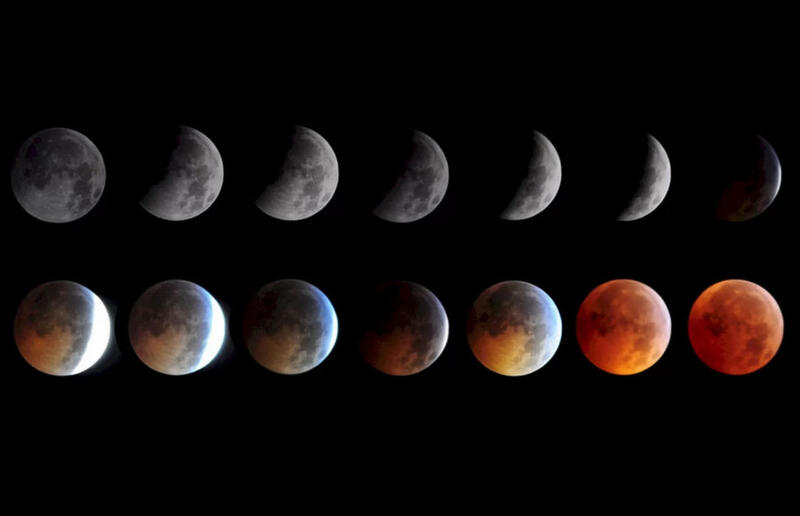 Editor's note: If you capture an amazing photo of video of the Jan. 31 total lunar eclipse and would like to share it with Space.com for a story or gallery, send images and comments to: spacephotos@space.com. You can follow Space.com on Twitter @Spacedotcom. We're also on Facebook & Google+.